I love the rhythm of that prose, and the way it erases the line between character and river. It does so for good reason, too: the character, Pearl, has died; those are her ashes being scattered in the river, apparently still self-aware. They’re being scattered by Pearl’s daughter Ada, who’s returned to the valley to sort out Pearl’s old house; and Ada’s six-year-old daughter Pepper, who never knew Pearl at all. Weathering is the story of how the three generations deal with their sudden change in circumstances. It’s easy enough to imagine a situation like this being the subject of a straightforward social realist novel – but such a novel would likely have been less interesting and powerful than Weathering. What makes Wood’s book so striking is its sense of what it is to be in that raw landscape. Each of the three protagonists has reason to feel particularly close to the valley: Pearl lived there for years, and of course is now literally part of it. For a wild soul like Pepper, whose life is just beginning, the valley is a place of excitement and colour. For Ada, who thought she’d got away from the valley years ago, it’s dreary and miserable. Key to Wood’s technique is that she does not allow the valley to become known. For all the vivid descriptions of place, there are no names; this is not somewhere that can be given a label, and thereby given shape. Choppy sentence fragments disrupt the easy flow of understanding; like the characters, we as readers are plunged straight into a new world and have to orient ourselves as best we can. We can also see this at work in the dialogue, which – like real conversation – is often laden with the unspoken, which can be stifling for Ada, because she finds herself having to be the person others remember, rather than the person she feels she is now; when the village shopkeeper tells her about a collection for ‘old Edwards’, Ada’s emphatic reply of ‘I don’t know who he is’ (p. 35) seems very much like a forlorn attempt to distance herself from the past. As the novel progresses, and Pepper and Ada become more comfortable in their surroundings, so the dialogue and descriptive prose become more conventionally novelistic – but never entirely; the valley will not be tamed. The title of Weathering has two meanings: being worn away by time, but also holding on, riding out the storm. Ultimately, Wood’s characters experience something of both, as they try to find a place for themselves when the river is the thing that will carry on. Whereas in Diving Belles magic and story lay beneath the surface of everyday life, here it’s the deeper reality of the landscape that pushes through into the characters’ lives. […]‘It certainly is cold today,’ [Pepper] said. ‘What are you talking about that for?’ The woman said. Why indeed? Weathering is a novel that says just what it needs to say, in its own idiosyncratic fashion. 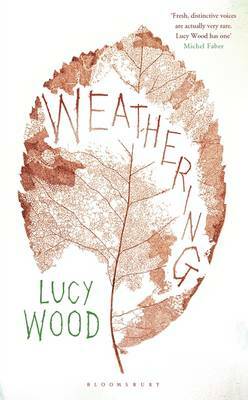 It cements Lucy Wood’s voice as one that will continue to have my full attention. Mary at Our Book Reviews Online loves Wood’s prose. A Life in Books has some more choice quotes. A couple of newspaper reviews: Catherine Taylor for the Telegraph and Sarah Perry for the Guardian. And two interesting interviews with Lucy Wood, in the Independent and The Clearing. A fine review, David, and many thanks for the mention. Such a striking book! I loved Wood’s use of language and thought she managed the supernatural element beautifully. Interesting choice of quotes, sounds like one to watch out for and her first collection. Susan: Thanks! I really do think that the way she shifts her language around makes the book extra special; and you’re right, she gets the balance of the supernatural spot on. Claire: Absolutely, read them both! Hm, if it weren’t you praising it I’d have my doubts as it didn’t grab me conceptually. I’ll check it out though. Would Diving Belles be a better Wood starting point? Hi Max. I think either of her books would be good to start with, depending on your preference – Diving Belles is based on folklore, whereas Weathering is more of a ghost story. Actually, I did wonder while I was reading Weathering whether you’d like it: it reminded me of Amy Sackville’s Orkney in places, in terms of how it treats the landscape. Thanks. On a more vulgar note Diving Belles is currently much cheaper, so it’ll be that one first. Thanks for this. I’ve just read this and can’t praise it highly enough. I couldn’t help thinking she must be a poetry reader and found an interview that says she is. I agree with you too that in other hands it could be just another social realist novel – it’s not a new idea on one level – but it’s all in the levels, isn’t it? What a delight to read something so fresh and vital. I’m planning to write about it but need to let it compost – at the moment when I start to write all I want to do is quote bits. I’ve come around to the view lately that even the most well-worn ideas can still flourish in the right circumstances. You can see it in Weathering, you can see it in the work of (say) Eimear McBride – or in Wood’s collection Diving Belles for that matter. In each case, the authors are firmly doing their own thing, finding their own language for what they’re driven to write.